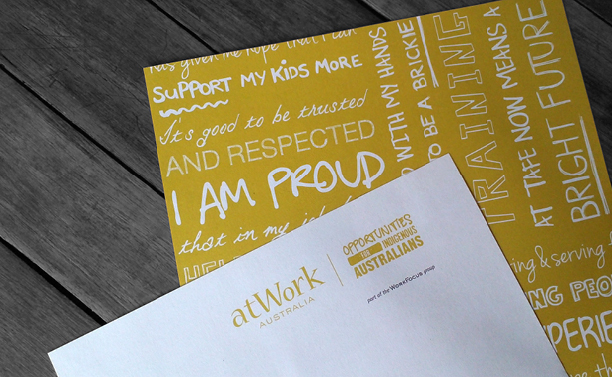 Brief: The atWork Australia Specialist Indigenous Provider contract required branding that would 'speak' particularly to the 'under 25s' unemployed and reflect the Western Australian Indigenous culture. 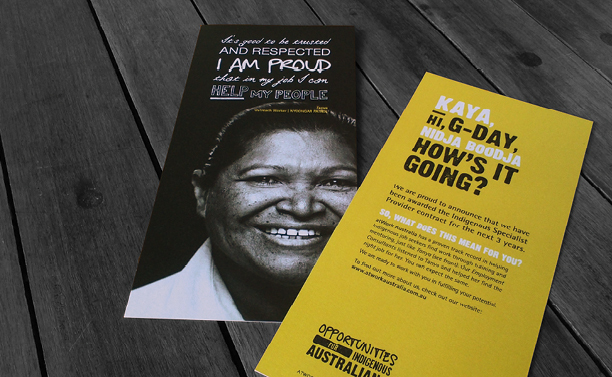 While still fitting within existing atWork visual branding, the support marketing material needed to portray atWork as a capable and preferred provider. Rationale: After research, discussion and brainstorming it became evident that 3 key elements were required to visually represent the new contract successfully. These were: a new logotype; a secondary graphic testimonial device; and photography of relevant Indigenous clients. The set of striking portraits and their testimonials featured on marketing material to create credibility while conveying the message that employment is the gateway to a better life. Overall these elements, with the visual styling, created the 'look and feel' required to make atWork appealing and approachable to its target audience. The WorkFocus Group exists to make a real and measurable impact on employment opportunities for people with injury, illness, disability or disadvantage. The Group includes WorkFocus Australia, atWork Australia, Kairros and LabourNet; and also delivers innovative services on behalf of the Australian Government, including JobAccess and the National Disability Recruitment Coordinator (NDRC). Great Circle Design has been fortunate indeed, to collaborate with the Group on creating and maintaining visual brands for many of these businesses and service offerings since 2003.